Indian food is not the prettiest thing to photograph… especially when you are really hungry. Vegan Mushroom Masala is no exception to this general rule. This recipe was born out of my need to use up some yummy exotic nameko mushrooms that were given to me. I was also craving Indian food. 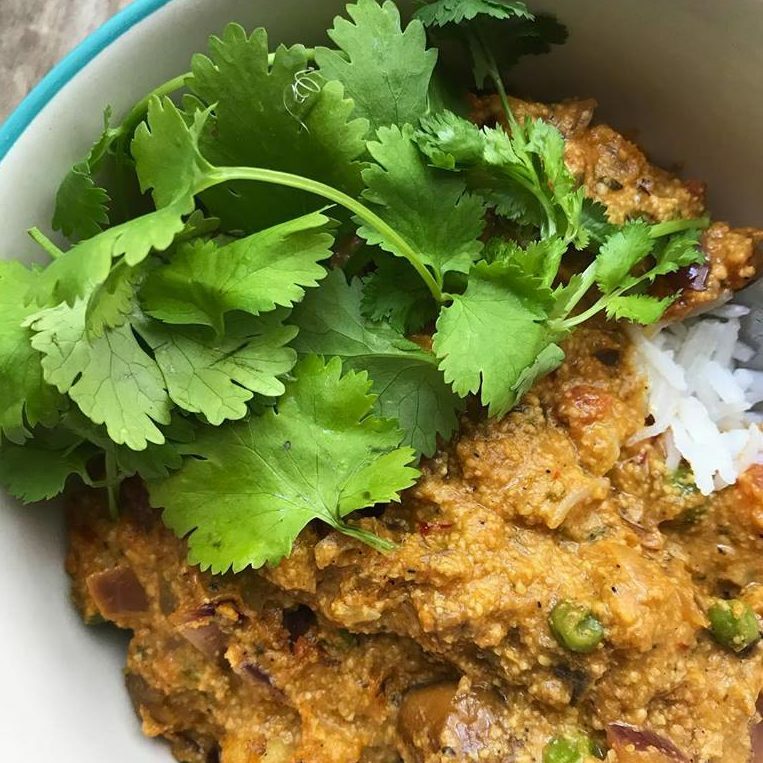 On Pinterest, I found a few recipes to make with my mushrooms and came across Vegan Richa’s pretty photos of mushroom masala and I was intrigued. I’ve had lots of masala, but never with mushrooms. Being kind of a mushroom freak, I wanted to try this. Not to mention, if these particular mushrooms ended up not working out (like those white ones at the Thai place that were rubbery and gross), the spices in a masala dish would reduce the gag reflux for sure. Masala’s delicious spice combinations can hide a lot of irritating qualities… like canned veggies… for those lazy restaurants who don’t make them fresh – for shame! By the way, I really did love the mushrooms and they were perfect in this dish – yellow and dainty (probably some of the better tasting mushrooms I’ve ever had, really)… but it was hard to see them with all the spices coloring this dish. Puree garlic, ginger, chili with 2 tablespoons of water in a food processor or blender. Add tomato, spices and soaked cashews and blend until mixed well. Sautee onions and mushrooms in butter or oil on large skillet over medium-high heat. Add puree mixture and 1/2 cup of water or broth. Add salt, sugar/monk fruit crystals, oregano leaves, peas, and chick peas and continue to stir and cook over medium-heat. Add butter/oil and/or broth or water if needed (to desired consistency – I like it to be a little runny so the juices seep into my rice bowl). Cover and cook for 10 minutes on low, checking and stirring frequently. Garnish with cilantro and serve over basmati rice. Score! That’s what a cook wants to hear. I’ve been on a fenugreek kick lately. Ethiopians also use it a lot. I had Ethiopian lentil and chicken stew for lunch today! That recipe will have to come at a later date. One tablespoon of fenugreek has nearly 20% of your daily iron intake! According to Dr. Axe, it helps improve digestion and cholesterol levels, reduces digestive inflammation, is great for ulcerative colitis, shows potential in reducing all inflammation (listed were the following types: mouth ulcers, boils, infections of the skin, tuberculosis, chronic cough, cancer, and kidney ailments), regulates blood sugars, helps with metabolism, reduces phlegm, and reduces arthritis. It is also supposed to help with libido, baldness, hernia, breastfeeding, pain and swelling, gout, ulcers, sciatica, dandruff, eczema, and eating disorders. It has the smell of maple syrup and is used to flavor tobacco, beverages, and other foods. It is said to improve performance in exercising, also – according to a study done on men who did a four-day a week resistance training program for eight weeks (making it on the list of best foods to eat for athletes). Hmmmmm? Maybe the Lord is trying to tell me something? A friend of mine told me she was using it to help her with milk production when her son was tiny – and that it reminded her of maple syrup. Today it is most widely used in Indian curries. You may also find it in Jamaican and Ethiopian or other African dishes. My mom had it in her pantry as an herb to help with blood sugar, which is why I even have it in my spice cabinet right now. Every time I use it, I think of her… and how ironic it is that she had the key ingredient for Indian and Ethiopian food dishes in her tiny kitchen… when she never liked either of those cuisines! Dr. Axe has another Masala recipe on his site that is a little different than mine. It sounds sort of like a mix of this Indian dish in my recipe here… and the Ethiopian chicken and lentil dish I had for lunch today! Either way, both of them were yummy, and his recipe sounds great. Happy to link it here for you as well.